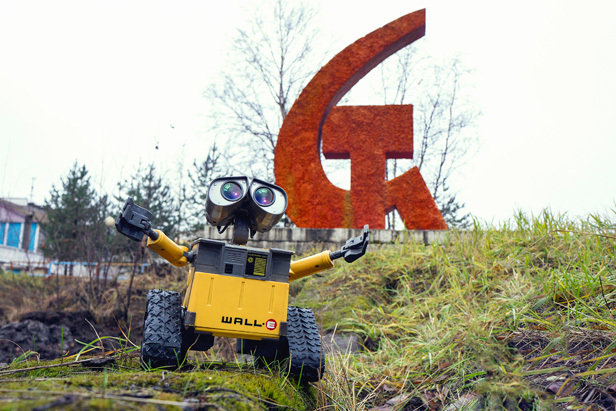 This little robot may have travelled to outer space and back, but Wall-E has now also seen most of Russia. After trekking around the biggest country in the world, the miniature machine now boasts an impressive portfolio of pictures. Created by photographer Aleksandr Natalichev, 43, the crazy idea to create the robot came about after watching tourists take pictures in St. Petersburg. In an effort to personalise his own photographs, the former advertising ace came up with the idea of snapping the droid in front of some of Russia’s most famous buildings and monuments. Inspired by his favourite films! Wall-E and Short Circuit, Aleksandr uses a small two-inch figurine as well as a large remote-controlled version of the animated character to create the comical images.